Universal Laser Systems has developed the world’s most advanced, powerful and flexible laser print driver. Laser Interface+ is a materials-based print driver that gives you the choice of automatic or manual control over power, speed, pulses per inch and other system settings. We developed this software to make any photographic image suitable for laser engraving. Simply select your target material from a list and 1-Touch Laser Photo will determine the appropriate contrast, filter and grayscale levels and calculate the ideal laser speed and power settings. Then engrave the image onto your material at the touch of a button. Our exclusive line of patented CO2 Free-Space Gas Slab Lasers is designed specifically for the needs of laser cutting, engraving, graphic imaging and marking applications. Our lasers produce an excellent quality beam with even power distribution and good near and far field characteristics. We design and manufacture all of our lasers which range in power from 20W to 150W. Each laser cartridge is precision-aligned prior to shipment and can easily be interchanged with cartridges of differing power. These optics allow the laser beam to be focused to a much smaller spot, producing sharper images at tighter tolerances. It’s particularly suited to intricate engraving and direct marking on some metals. Every laser cartridge we produce is factory pre-aligned for easy integration into any of our laser platforms. This laser modularity delivers ultimate flexibility when configuring your laser system. The PLS6.150D, PLS6.150D (with SuperSpeed), ILS9.75 and ILS12.75 are all engineered for Dual Laser Configuration. These machines give you the ability to merge two independent laser sources into a single beam for additional power and flexibility. This feature was developed primarily for raster image applications and requires a Dual Laser Configuration. This innovation pulses the two lasers independently, allowing for two lines of a raster image to be marked simultaneously. For vector cutting, the lasers can be joined to take advantage of their combined power. The PLS6.150D with SuperSpeed platform is designed and engineered for applications requiring high speed and maximum power flexibility. The PLS6.150D comes standard with SuperSpeed and Dual Laser Configuration. SuperSpeed was developed primarily for raster image applications. This patented technology pulses the two laser beams independently, making it possible for two lines of a raster image to be marked simultaneously. The laser beams can also be combined for high-power vector cutting. The PLS6.150D has a processing power range of 20 watts, using two 10-watt lasers, to 150 watts, using two 75-watt lasers. The material processing envelope is 32" x 18" x 9", 5,184 in3 (813 x 457 x 229mm, 84,950 cm3). The PLS6.150D with SuperSpeed is particularly suited to businesses requiring both high-speed raster engraving and powerful vector cutting. 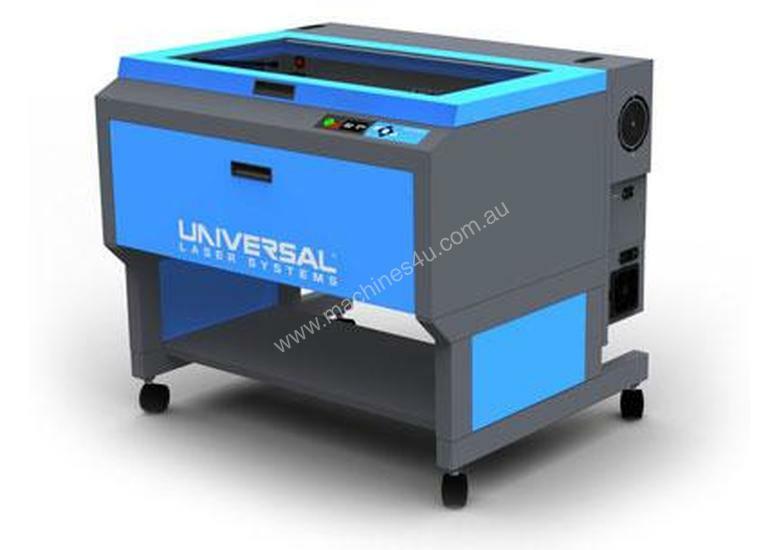 There are also a number of patented Uniquely Universal features designed to expand your processing capabilities that are only available from Universal Laser Systems. On the PLS6.150D with SuperSpeed, Laser Interface+, Rapid Reconfiguration and Dual Laser Configuration are Uniquely Universal features that come standard. All Universal laser platforms use interchangeable components, giving you the ability to tailor your system to fit your needs.